We estimate current total money value of these shorts to be at about €1.33b. 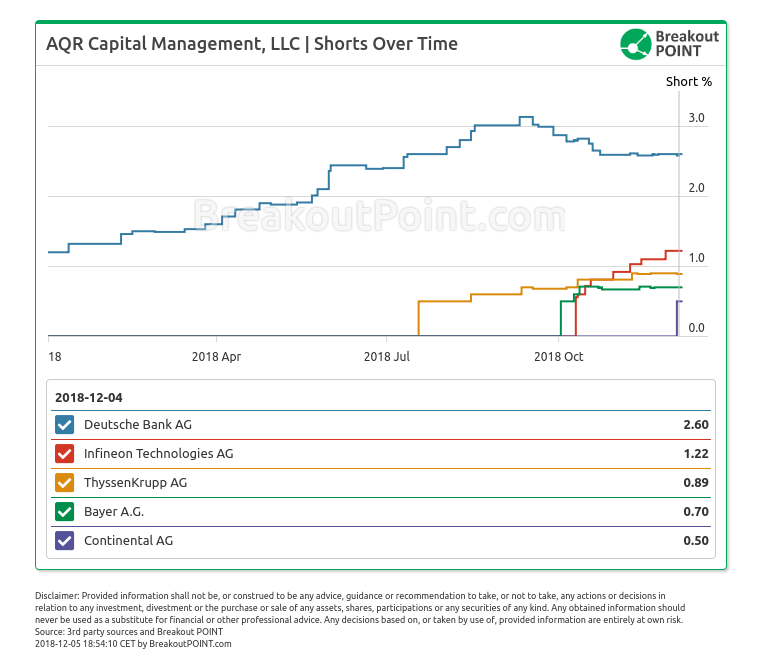 Except for Deutsche Bank short, all AQR's DAX shorts appeared in the second half of the year. The current big Deutsche Bank short has been in place since September 2017 when Deutsche Bank was trading around €14 versus around €8 today (Note that Deutsche Bank is the most shorted DAX member in our records. 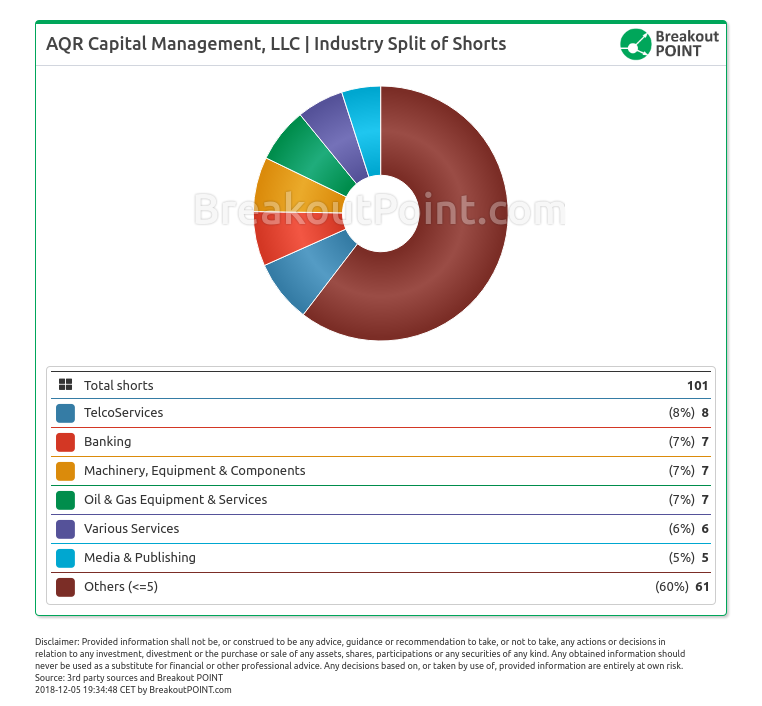 Total short interest of 4.58% is split as follows: AQR 2.6%, Marshall Wace 1.46%, and Simon's Renaissance Technologies 0.52%). According to our records, this is the highest number of big shorts in DAX by a single hedge fund since Q1, when more than dozen DAX shorts by Bridgewater appeared. All of Ray Dalio's German shorts were cut under <0.5% in April and never re-appeared. 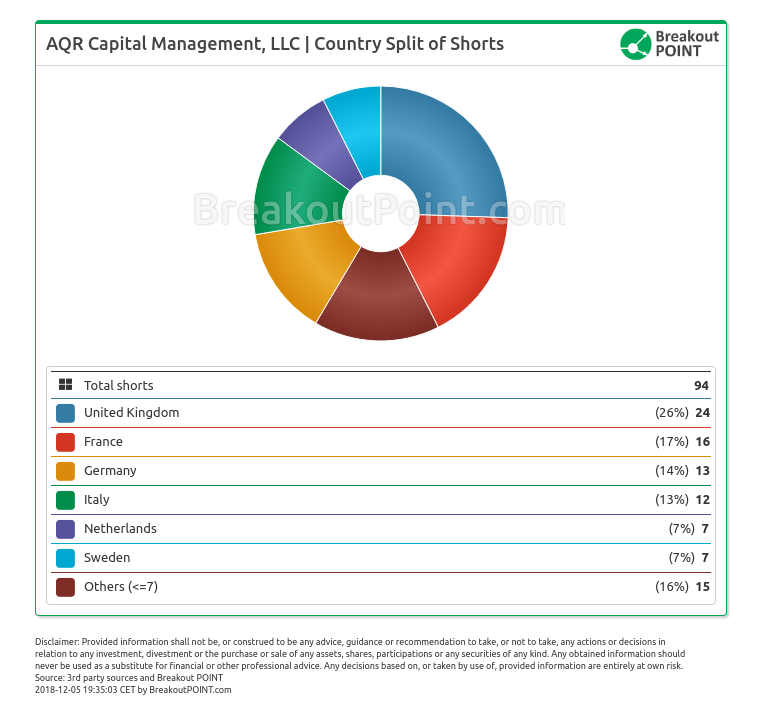 Similarly, all Bridgewater's EU big shorts (Italy, Spain, France, Netherlands, UK,...), were cut latest in July. Interestingly, as of latest disclosures, Bridgewater holds only one big short: OUTOKUMPU OYJ, 0.61% short, that popped up on our radar on 30th of October. Merian Global Investors with a 0.91% short position in HeidelbergCement and a 0.5% short in Deutsche Boerse. More about short selling and the biggest short positions in Germany can be found in WELT's article here. Overall AQR's EU big shorts portfolio appears to be rather well diversified among EU countries, as well as sectors. As comparison, one of the currently most active short sellers in our records, GLG Partners holds about 80% of their shorts in UK.